Working with people with dementia? 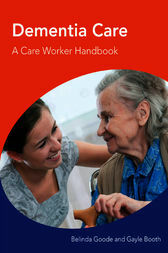 Training in adult or dementia care? You don't have to go it alone! Caring for people with dementia is one of the most challenging and rewarding roles in Health and Social Care. But with a range of awards, certificates and pathways for work-based learners it can be a confusing area for qualifications. That's why we've put together a one-stop handbook to support your training and continuing professional development in demential care. Here in one place is all the topic knowledge, assessment support and practical advice you will need for a range of dementia care qualifications. Core topics are linked to the specific learning and assessment objectives you need to cover for 16 QCF dementia units. Case studies tie learning into the many different settings and roles across Home Care, Residential Care, NHS and Private Settings. Level 3 Diploma Health and Social Care Dementia Pathway. It's also a must have reference for those who want to brush up skills and knowledge from previous qualifications. So whatever your level of specialism, give yourself the tools you need to survive and even flourish in dementia care.